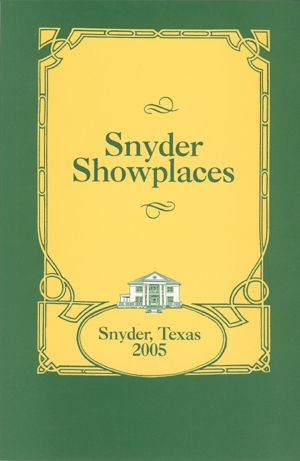 The town of Snyder in West Texas presents this survey of their historic buildings as “a step back in time.” There are photographs of fifteen houses – the oldest built in 1883 – and a hotel and movie theatres. Separate chapters tell the stories of these structures and of the people who built them, and in so-doing give a picture of life in the early days of the settlement of West Texas. A map shows the location of the buildings, and material from the annals of the local newspaper add historical details. Design and drawings are by Paul Hudgins.